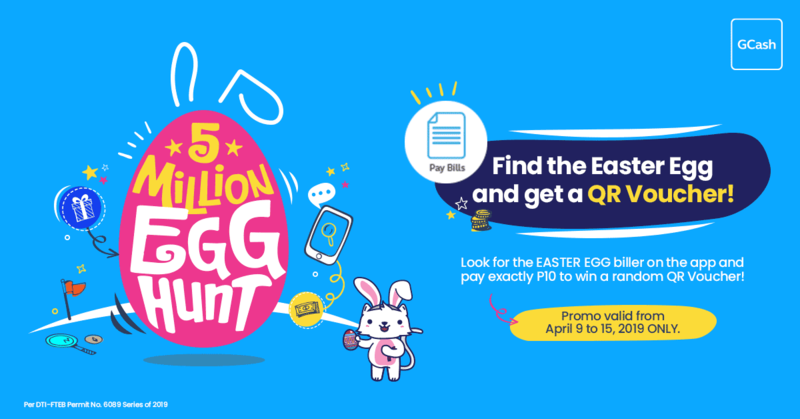 Get a chance to win up to P100 worth of QR vouchers when you pay exactly P10.00 to the Easter Egg biller! This promotion is valid from April 9 – 15, 2019. User must pay EXACTLY P10.00 to be eligible for the promo. User will be awarded a random QR voucher worth between P20.00 – P100.00. Only payments made to Easter Egg Hunt Biller are eligible for this promo. Use of this promo is limited to once (1) per customer only. Users will only be awarded once. Multiple payments from the same user will not be awarded. This promotion is not valid in conjunction with any other ongoing GCash Pay Bills promotion for the month of April. In the event that customers are eligible for multiple ongoing promos, he will be awarded the reward with higher value. QR voucher will be awarded within five (5) working days following your transaction. Eligible users will be informed via SMS. GCash, in its sole discretion, reserves the right to refuse the awarding of cashback for suspicion of abuse or fraud. What will the voucher reward be? Is there a minimum transaction amount to avail of this promotion? Users must pay exactly P10.00 to be eligible for this promotion. How do I pay my bills with GCash? Download the GCash App through Google Play Store or App Store. Log-in to your GCash Account on the GCash App. Click ‘Pay Bills’ on the middle part of the screen. Input the required details such as Reference/Account Number and Amount. Confirm the accuracy and completeness of the details entered. You will receive a confirmation SMS with your transaction details. Can I use the promo once per day? No, this promotion can only be used for your first ever bills payment. The use of this promo is limited to once (1) per customer. Are all billers eligible for this promotion? No, only bills payments made to the Easter Egg Hunt biller are eligible for this promo. I participated in another GCash Pay Bills promo. Am I still eligible for this promotion? No, this promotion is not valid in conjunction with any other ongoing GCash Pay Bills promo for the month of April. In the event that the customer is eligible for more than one ongoing promo, the customer will be awarded the reward with the higher value. QR voucher will be awarded within five (5) working days following your first Pay Bills transaction. I did not receive my cashback. What should I do?